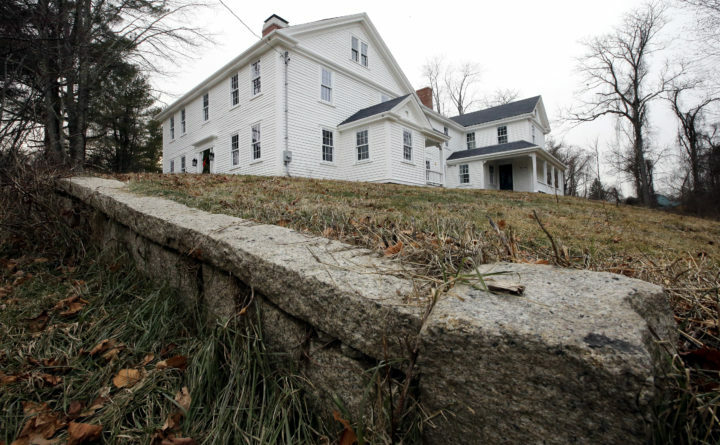 A wall stands near the home where Sarah Clayes lived, in Framingham, Massachusetts, after leaving Salem, Massachusetts, following the 1692 witch trials. Clayes was jailed during the witch trials but was freed in 1693 when the hysteria died down. BOSTON — A once-run-down historic home that stands where a woman accused of witchcraft during the 1692 Salem witch trials settled after she was spared the noose is on the market after an extensive renovation project. The home in Framingham, Massachusetts, known as the Peter and Sarah Clayes House, hit the market Thursday with an asking price of $975,000. An open house was planned for Sunday. Annie Murphy, executive director of the Framingham History Center and a member of the trust formed to save the structure that had fallen into disrepair, is confident someone who appreciates history will snap up the property. “We’ve already done tours, and I had people coming up to me practically in tears, they were so thrilled we had saved this house,” she said. Sarah Clayes was jailed during the 1692 witch trials, which claimed the lives of 20 people, including her sisters, Rebecca Nurse and Mary Easty. She was freed in 1693 when the hysteria died down. Sarah and her husband, Peter, along with other members of their extended family, resettled on land about 35 miles southwest of Salem that in 1700 became the town of Framingham. Historians acknowledge that little, if any, of the original home built at the site in 1693 remains. The structure still standing dates to 1776. After a foreclosure around 2000, the privately owned home was abandoned and became derelict. It was vandalized and defaced with graffiti. The trust was created to make renovations that turned out to be way more complicated than anticipated, said Murphy, who herself spent hours scraping paint and pulling weeds to help her contractor husband, Ned, complete the work. The 4,253-square-foot, five-bedroom home on a little more than an acre of land has been updated with modern conveniences yet retains some old features, including much of the woodwork and floors, plaster stenciling in one room that dates to the 1820s, and restored claw-foot bathtubs. The property includes a 150-year-old American elm, a brook and the ruins of an old mill. “It’s been a labor of love,” Murphy said.